What do all those have in common you might ask? Well, first of all I can recommend two of the three as great ways to get a thrill. One is illegal and morally questionable, not to mention life wrecking. All are addictive, all can be gratifying. But of the three, only one can bring together all those positive aspects with none of the negatives and be beneficial to many folks as well. That one is, you guessed it, HOG HUNTING! 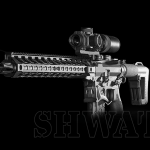 As a recent Hog Hunting Junkie (HHJ) and founding SHWAT supporter, I’d like to tell you my story. Consider this like a Alcoholics Anonymous meeting. Hi My name is Mark and I’ve got Hog Hunting Addiction. It all started when I went to SE TX on a hunt for Ruger Adventures Television. The object of the hunt was a trophy whitetail, a noble endeavor in itself. However as I prepared for the hunt, I considered the possibility of other game. Once I inquired I was informed by that I would be allowed to take one Javelina and one Hog if the opportunity presented itself on the hunt. Now I was REALLY excited, this could turn into a trifecta! I ended up taking all three species and have a freezer full of venison and hog, plus nice rack on the wall to show for it. But this is about the hog hunt, so lets talk about that. As we were driving about the ranch (45,000 acres! :-O) on one of the ranch roads, I spotted a group of hogs several hundred yards off on a ridge. Motioning to the driver to stop the truck, I glassed them, and found that one was a huge boar, and as well I could see had some pretty good cutters on him. Now keep in mind, this is my first hog hunt ever. My adrenaline immediately jumped up, and I asked about going after him. Our driver/guide explained that he’d be moving down through a draw given his direction of travel and known habits. He also explained a way we (remember we’re filming TV so I have a cameraman in tow) could circle the hog and cut him off. I looked back at Jeff, the cameraman, in the back seat of the F350 with what were probably pleading eyes. He grinned that “let’s go get ‘im” grin he has. We quietly bailed out of truck, readied guns and camera gear, and crouch/walked into cover and away from the road. About 20 yds into the cover, it started getting noisy underfoot and we had to slow waayyy down. The wind was steadily in our favor though, so that was a good thing. The way I had it figured, we had about 75-100 yds to cover to where we should be able to see the draw and hopefully get a shot at the hog as he travelled through. We pressed on, choosing steps carefully and moving at such a slow pace I could hardly stand it. About another 25 yds in, I heard the hog squeal and grunt, answered by another one right near him! The sound sent electricity through every nerve in my body. Freezing and listening, I pinpointed the sound about 50yds ahead and below my line of sight down in the draw, we were right on target! I have to say that wild hogs squeal, and the answering one sent more excitement through me than any buck or turkey I’d ever laid sight pin or crosshair on, and I had not even drawn a bead on him yet! WOW! I had to literally force myself to calm down and remember this was a stalk, so as not to blow it. Easing forward a few more yards I started to crest the ridge and see into the draw, stopping literally every one or two steps to look and try and spot him in the brush. The progress was painfully slow, but I knew that hog could hear and smell better than I could. The wind was still on our side so we just had to be quiet and smart. After another 15-20 yds, I could see well into the draw. Only my head should be visible from within the draw, I had good cover and brush behind me to conceal even that. Stopping to look again and slowly looking for any patch of hair, hoof or snout, I saw him! He moved about 3 steps and crossed through a clear spot, then behind another bush and out of sight. I turned to Jeff and he had not spotted him. DANG! We crept forward a mere 5 or 6 more yards to give Jeff a better camera angle and crouched down to wait and watch. After only a few moments, the hog moved again, this time Jeff picked him up to, but he moved along a bit too much. We knew we would have to move forward more for a shot. We started to creep forward again and made it about 5 yds, when a squeal to my left front was accompanied by exploding brush. A huge brown hog with black spots burst away from us and right past the one we were stalking! Both of them took no time finding somewhere a long ways from us to stop. The second hog had literally busted out, not 10 yds in front of us. We had been so intent on getting a line on the black one, we totally missed the other one! Not that that is not hard to do, believe it or not. Those big animals can hide in the thickest stuff you could imagine and basically disappear. It was a this point I realized I was shaking. Now I’m not a timid man and I’ve got a decent amount of hunting experience, and can draw down on and drop a trophy buck with not a bit of a tremble, cool as you please. But that hog squealing and not being able to spot him, coupled with the second one blasting out of that brush, sent more adrenaline through my system than I’d felt in years! I was ready for more! We knew we were busted on those two. No way we were gonna get close to them again, but there had been quite a few hogs on that ridge when we first spotted them. Taking note of our position and that of the ridge we saw them on originally, we decided to press on and see if any were still hanging around on that ridge. We covered a couple hundred yards rather quickly as we had the advantage of working the edge of the road for cover but still keeping our feet in the quiet sand of the road. Still blessed with the wind in our faces, we pressed forward and eased our line of sight over a ridge to where we could see the spot we hoped they were still milling about in. Several hogs still remained rooting about and generally doing hog stuff to their contentment with no clue that we we closing on them. Easing back a bit and using the draw and cover to our advantage we crossed the road and pressed forward, slowly closing another 50 yds or so. At this point I could see a nice red sow that looked like she’d make a good butchering hog and picked her out. Unfortunately, we were in a bad spot though, both for the camera and the shot. Crouching low and breathing our words and using hand signals, Jeff and I decided on a spot just 10 or so yds further on and behind a clump of trees to make the shot and get it on camera. With softer ground under foot than before It was easier to move quietly and we eased into position, I looked back at Jeff and he gave me a thumbs up that he had good camera angle this time. I eased forward and rested my left hand against a tree while gripping the forearm of my Ruger Gunsite Scout Rifle. Taking a nice even breath and letting it 1/2 way out, I eased into the trigger, BOOOM! A 165 grain Hornady bullet lept from the bbl and smacked her solidly in the shoulder. I expected her to drop like a wet rag, but she did not! Hit hard in the shoulder but not downed, she staggered off into the brush on the other side of the road. Now I had a solidly hit, yet not dead hog to track. Fortunately the others bolted for other states in the nation at the sound of the shot. We picked up a little blood where she’d been hit and a drop or two indicating her direction, after only a few steps she bolted from cover almost under foot, giving me the second huge adrenaline dump of the day. Stopping about 30yds out she paused to draw a breath. It never came to her as a second 165 grain bullet slammed in behind her ribs and drove forward, wrecking her boiler room and anchoring her in place without a twitch. Calming down and moving up to her, I squatted down and admired my first hog! Hooked forever like a crack junkie, I KNEW hog hunting was for me. Upon my return home, I immediately set about ordering a 458 SOCOM upper for my favorite AR and booked two hog specific hunts near my home. I can’t wait for my next fix! 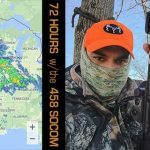 This entry was posted in Mark Craighead Unleashed and tagged .458 SOCOM, Addiction, Hog, Hunting, Ruger Adventures Television by Mark Craighead. Bookmark the permalink.